That Dr David Livingstone was a great man goes without saying. How else can a man have his name in monuments in so many countries in Africa, America and Europe? Livingstone’s life is well-documented, in books, journals and he provides fodder for the historian seeking to piece up history. To the Malawian, Livingstone occupies a great space. Apparently, Malawi history records that the evangelist and medical doctor brought to Malawi commerce, modern medicine, Christianity and civilisation. We forsake the fact that there were iron smelters in the land before Livingstone set in, hence the name Malawi. The name is derived from the flames of fire rising from their furnances. Obviously, the iron smelters were selling their wares, either in exchanging of food or cowrie shells. There was fair trade before Livingstone. History teaches us of the barter trade before the arrival of Livingstone. That the natives healed the sick, however crude the means, before he set foot on the land is also clear in illustrations in history books. That Livingstone discovered the lake is also quite surprising because we are told that he asked the people what the big body of water was called, and the natives replied: "Nyasa." In Yao, nyasa is lake and Livingstone was claimed to have discovered Lake Nyasa, which is also referred to in some texts as Lake Niyesse, a corruption of what the locals called nyenyezi—a star. Livingstone was no stranger to the bright stars sparkling on the lake that he eventually referred to as the Lake of Stars. It goes beyond doubt that Livingstone played a great part in the termination of slavery that was rampant in Africa at the time of his expeditions, which began with his setting out to Rio de Janeiro in Brazil between 1840 and 1841 until his death at Chitambo in Zambia in 1873. Credit must be given to Livingstone for introducing education and a religion that has seen the good people better and the bad people good. The glow, sadly, has to depart from the saints at times. There is an aspect of Livingstone that is often obscured by his bright side. It is given that he is one of the forerunners for African countries, including Malawi. It must be noted that at the time Livingstone came to Africa, it was referred to as the Dark Continent. This is so because much of Africa was not yet ‘discovered’ and this led to many gaps on the world map. Others saw Africa as a land of brutal and savage barbarians, an inferior race. As Joseph Conrad notes in his novel The Heart of Darkness, there were many blank spaces on the earth, the biggest—most blank—so to speak was Africa. In the work, Africa is portrayed as a dark place, alien to civilisation. This is the work that led later African authors like Chinua Achebe to come up with works like Things Fall Apart, which sought to clear the notion that there was no civilisation in Africa before the Europeans set in. 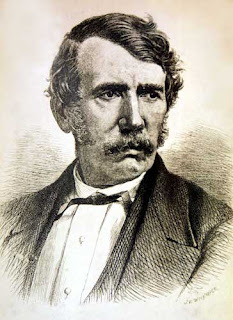 George Seaver notes in David Livingstone: His Life and Letters, that on coming to Africa, Livingstone believed in European supremacy over Africans. In a letter on his Zambezi expedition, seaver quotes Livingstone as having written: "We come among them (the Africans) as members of a superior race and as servants of a Government that desires to elevate the more degraded portions of the human family. We are adherents of a benign holy religion and may by consistent conduct and wise patient efforts become the harbingers of peace to a hitherto distracted and down-trodden race." Seaver continues to observe that Livingstone believed Christianity and commerce would produce civilisation in Africa. In Narrative of the Expedition to the Zambesi and its Tributaries, Livingstone wrote: "We don’t believe in the incapacity of the African, either in mind or heart.... The Africans have wonderfully borne up under unnatural conditions, that would have proved fatal to most races." When he dicovered Lake Shirwa (Lake Chilwa) and Lake Nyasa (Lake Malawi) in 1859, the slave trade was at its peak. African slaves were being shipped from the African inland and in Malawi, the popular slave house at Linga in Nkhota Kota was a point of conduit for the slave trade. Therefore, the ‘discovery’ of Lake Malawi helped in conquering the slave traders. There is a thin line separating Livingstone’s fight against slavery and the expansion of his own economic thirsts. At the time, the British were buying cotton from America. This infuriated Livingstone, who believed white emigration and capital investment overseas were instruments in the creation of an international human brotherhood. He felt the British were wrong to continue purchasing cotton which was grown by slaves in America. He thought, and rightly so, that that contributed to continued slavery. In his view, Malawi cotton, which was to be grown all the way from the Shire-Zambezi confluence to the lake, would fetch 400 percent of that grown in cotton. "For giving increasing prices for slave-grown sugar and cotton. We are great supporters of slavery," Livingstone wrote. Malawi first produced cotton at a commercial scale in 1904, when 26 tons were produced. Ten years later, the produce grew six fold. Livingstone believed cotton would be Nyasaland’s main cash crop, but it was consequently overtaken by tea and tobacco. It can be noted that cotton was foremost on Livingstone’s mind since he was born and bred in Blantyre, Lanarkshire where cotton was a raw material for most of the industries. As a matter of fact, Livingstone himself had worked for the Blantyre Cotton Mills as a piecer and spinner for 13 years from 1823 before he entered Anderson’s College, Glasgow University to study medicine and theology. Livingstone’s commercial interests in Nyasaland were evident with the setting up of the Livinsgtonia Central Africa Company, which late became the African Lakes Company and finally the African Lakes Corporation. It is here that the other side of Livingstone becomes evident, as a forerunner of British imperialism in Malawi. In After Livingstone, Fred Moir recounts how he accompanied Livingstone in his expeditions on the Shire and Lake Nyasa. Fred and his brother John became founding fathers of the Mandala Limited of the African Lakes Corporation. Moir wrote that the purposes for the expeditions included: to discover the best method of utilising the river and lake to establish regular mail and goods transport services and to make friends with the natives. Events after Livingstone’s 1873 death, show the growth of the European interest in Nyasaland’s wealth. The coming of Mandala as the largest trading houses in the country bears witness to that. Of particular note, here are the decsendants of Livingstone who were influential in the running of Mandala as a corporate intetity. One was Alexander Bruce, who married Livingstone’s daughter Agness. Al Bruce as he was called was in-charge of the Likulezi Estate at the height of the land alienation in Nyasaland, where native Africans were forced to work for no pay under the Thangata System. The other was William Jarvis Livingstone, who was a grandson of the explorer. Historian Landeg White in Magomero: Portrait of a Village notes that Livingstone was a great cotton planter, who developed a new cotton variety called the Nyasaland Upland, which fetched more than the first grade of American Upland. He helped realise the explorer’s dream to sell to Britain cotton that was not grown by the slaves. Little is mentioned, however, that he used the Thangata to cultivate the 169,000 acres of land that he managed. W. J. Livingstone is also known as Listonia to the natives during the uprising against colonialism that was led by John Chilembwe in 1915. It is this Livingstone who burned down churches and schools which Chilembwe built. It is this Livingstone that Chilembwe’s forces beheaded. It must also be noted that Chilembwe and his forces broke into the Mandala manager’s house where they stole guns to use in their struggle. It is clear that Chilembwe’s political struggle was partly against the capitalist system that was set by the colonialists. While David Livingstone’s descendants were on the forefront of a brutal colonial force that began with Nyasaland becoming a British Protecorate in 1891, it is worth noting that Livingstone played a role in bringing about African nationalism in the land. The coming of the Church of Scotland, Dutch Reformed Church, Free Church of Scotland and other missions like the Universities Mission to Central Africa at the close of the 19th Century saw the establishment of schools, apart from the churches they built, from where many native Nyasas got education. These Africans were aware of Livingstone’s belief that ‘the stupid prejudice against colour’. The native Nyasas, who became teachers, evangelists, proto-nationalists, rose to fight for the freedom of their country in later years, long after Chilembwe’s death. Some of the notable names that went through the education system include Kamuzu Banda, who led Nyasaland to independence in 1964, Clements Kadalie, Daniel Malikebu and others. Like every coin, Livingstone’s life had two sides. On one side, he was a great conqueror of slavery, one who introduced education, religion, modern medicine and commerce. Yet, on the flip side, he is a forerunner of British imperialism in Africa. These two sides cannot outweigh each other, because they make the historic figure whole.